Recently, the people at Dell have been doing a few swanky things that have grabbed my attention. From their 3D gaming technology to their new teeny-tiny Alienware M11x laptop that has a motherboard so powerful it’ll make playing with Robocop seem like child’s play, to their current new release; the Dell Studio 17 Laptop with HD Multi-Touch screen. Yes, that’s right — you can now finger your laptop in public and it’s acceptable. At first glance, you can’t help but notice the size of the machine with its whopping 17.3-inch screen. In fact, the computer is so big the keyboard has its own number pad. I’m not entirely convinced that this is a necessary feature for any laptop, given the nature of a laptop is for it to be portable and convenient to transport. Another thing that lets this beast down is simply that the weight of the Studio 17 starts at an incredible 3.2kg — of course, depending on how much you decide to kit it out, this number can only go up. Just for the record, the one I have definitely weighs more than that. Nevertheless, once you get past the formalities, it’s actually a sweet little toy to play with. Already installed with Windows 7, the UI is impeccably efficient. 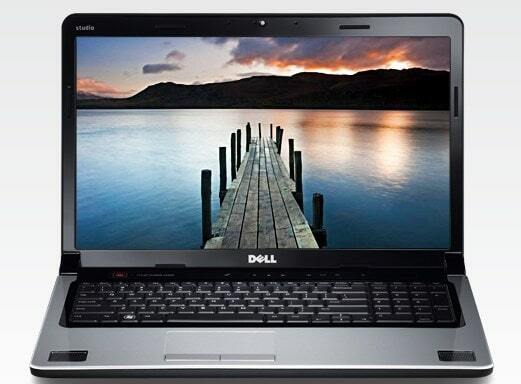 There are no lags nor are there any minor glitches; Dell has the performance of this laptop absolutely spot on. Now, if you’re as anally retentive as I can be you’ll appreciate how awful it is for there to be smudge marks, dust and everyday grease all over your screen. I have to admit I was a little sceptical of the finger-to-screen action that would be occurring on a regular basis with the glorious Multi-Touch HD+ at 1600×900 TrueLife WLED 900p. You definitely don’t want to be eating your burger and chips whilst trying to put on a film using the Multi-Touch function. I’m a pretty clean person as it happens and I’ve seen the state of a few laptops and computers in my time by people who don’t look after them. If you know you’re the type not to clean your hands properly or sit munching on a pack of crisps whilst simultaneously navigating your way around your laptop monitor using the touch screen, I would have to tell you not to bother with this machine. You’re going to destroy it faster than you might imagine. The response rate for the Multi-Touch screen is akin to that of the iPhone 3GS and it’s definitely a nice change to constantly having your fingers curled around a mouse. It’s a sure-fire way to avoid some hand RSI, however can just as easily lead to tiredness of the arms as they’re constantly in the air. Of course, you can simply rest your arms back down and use the mouse pad should you get tired. You’re able to get a model that supports up to four fingers, too, to maximise your grabbing, pinching, spanning, flicking and zooming pleasure. The audio and visuals on the laptop are very impressive, with integrated palmrest speakers of 1.5W each, plus a subwoofer with its own 3W. That tinny sound you’re used to hearing from laptops doesn’t exist with this one, as you’re surely going to find it one of the loudest and clearest of its kind currently on the market. When watching films or playing games, you’ll be presented with an ATI Mobility Radeon HD 4650 graphics card of anywhere up to 1GB. And this 1GB dedicated graphics memory option not only frees up space, but helps to improve both the system and graphics performance. 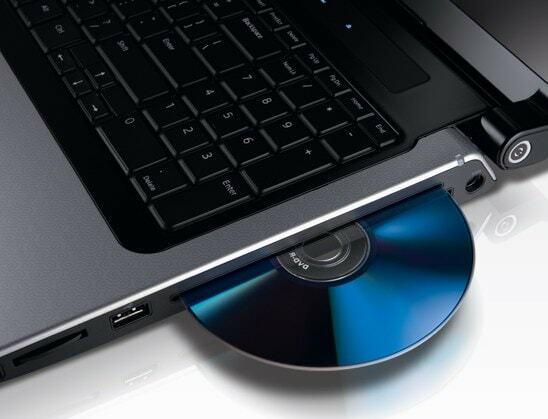 Also, if you’re feeling special, you’re completely welcome to upgrade to the Blu-Ray Disc drive. Let’s also not forget the built-in web cam which has a 2.0MP webcam as well as dual array mics. The webcam function is, quite sadly, the Chat Roulette user’s paradise as it allows you to change your face into that of a dog or a clown, for example, with sensors to spot your lip and eye movements. This is quite a nifty feature in terms of how technology is progressing for machines to use in your own home, but sadly doesn’t do much for those with a clown phobia (or coulrophobia). Aside from all the fancy schmancy geekery, there are also a few gimmicky options that make it appealing to the average, or just beginning, PC user. 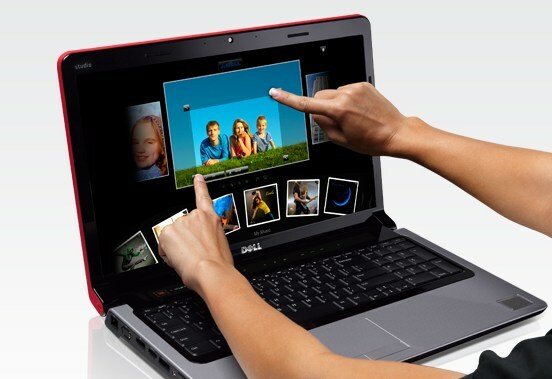 The Dell Touch Zone, as they call it, is located at the bottom centre of your monitor where you slide the toolbar, with your finger, left and right to see what options are available to you — and there are several; ranging from games, playing music and using the webcam, to photos, films, listening to music and browsing the Internet. The notepad function is a lot more interactive than the usual boring interface we’re used to allowing you to add photos and draw/write on it simply by touching the screen. You are able to change the colour of your post-it/font, as well as add little urgent signs or smiley faces (all additions also come with their own sound effects). I wouldn’t personally use this feature as, for me anyway, notes are quick little thoughts that are usually scattered around my brain that are now on paper — and this tool is a little arduous to get random and quick ideas typed out in quick succession. The photo and film galleries are the features that benefit the most from the touch screen function. It’s quick and easy to search and navigate your way through your collections of each using your index finger, allowing you to also play slideshows and edit as you please. There is always the music bar at the top of the screen as you fiddle around with the options in the Touch Zone, so you are able to use all of the player tools without having to constantly navigate out and back in. For fun, it has the music and game areas, both of which rely heavily on the touch screen usability. For the games, you are able to play multiplayer and have four fingers on the screen at a time — all of which are doing separate movements that it recognises. To play some of your own music you’re able to play on its little piano or the drum kit. Now, neither of these two options are actually bog standard PC requirements, but once you play with them you’ll wish they were! I feel slightly embarrassed to report that hours of fun can be had by playing the interactive piano — where you’ll be re-living that very scene from Big (but with your fingers). The drum kit also has a whole-heap-of-fun element attached to it in that you’ll be annoying anyone sitting in your near vicinity (or your neighbours if you so wish to make it loud enough) without having to own an actual drum kit. Genius. The only thing that would have made this better is if you and your friends could play the piano, drum kit and all the other heap of instruments displayed on the sides (including a cowbell, a xylophone, a set of bongos and a gong), together. Aside from the annoyance of having to (excuse the phrase) reach around your friends, the touch screen can support it — so why not make it so, Dell? 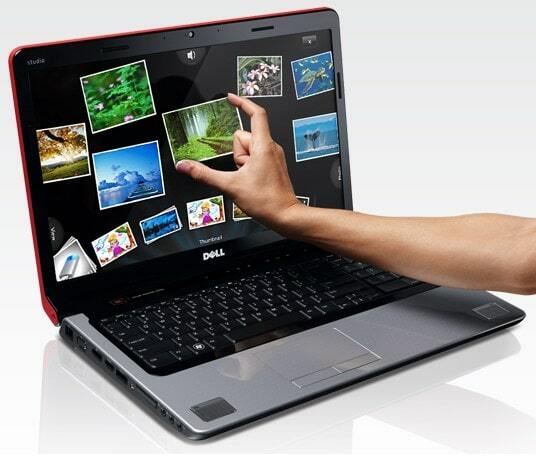 The Dell Studio 17 (Multi-Touch) laptop is definitely worth the money, as its performance will knock you sideways. The touch screen feature is also simply that — just an extra. You’re still able to use the mouse pad and you can only gain a much better UI by having it to use. My only concern with it is its size. Make it a little smaller, with perhaps a 15-inch screen and I think it’ll sell many more units. It’s not small person-friendly, I’m sorry to say, and although that usually doesn’t hinder my usage of everyday items, for a laptop this would be a massive burden to carry around with you. For more specification geekery, please visit the Dell Studio 17 website. Dell’s Della – Patronising Twaddle or Useful Social Engineering? Apple iPhone-Style 1 Inch Touch Screen Leaked, But What’s It For?